Here’s the knot I’ll be using as an example. As you work through, you’ll learn a lot more than just this one knot! You'll practise the skills you’ll need so as to know how to draw Celtic knots of your own. You should then be able to design your own page borders, knot decorations, illuminated letters etc. Pencil, paper, and eraser for the working drawings. A small ruler for measuring out the squares. Black (or colour) for filling in your Celtic knot design at the end. For this demo sketch, I used lamp-black watercolour with a fine brush for filling in. Drawing ink and a narrow, not too flexible dip-nib will also give you beautiful results, or if you need super-fine control and crisp edges for a finished piece, go for a professional drawing pen – my gold standard is the Rotring Isograph Technical Pen. Anyway, enough about my sins! Let’s get started. When you learn how to draw Celtic knots, you’re actually learning how to plait on paper. All Celtic knotwork or interlace is based on the structure of a plait with (usually) two, three, four, five or six strands. By interrupting this plait in certain ways, linked knots are created. The one thing all plaits and weaves have in common is crossed cords (or crossed strands, cables, strings, lines, strips etc). 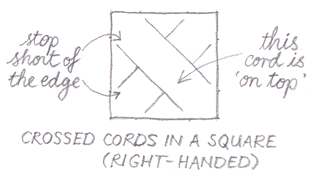 Cords cross each other, over and under, to make all plaits and interlaced patterns. 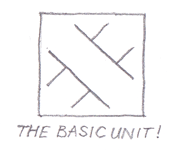 So here’s the first secret – the real starting point for how to draw Celtic knots is not a plait but a simpler unit – the building block of all Celtic knots: two crossed cords in a square. If the other cord were on top, it would be a ‘left-handed cross’. Both are necessary. All Celtic knotwork consists of lines of right-handed crosses alternating with lines of left-handed. Together, these construct the ‘over-and-under’ of a woven design. We’re going to start by using right-handed crossed cords, and add the left-handeds later. 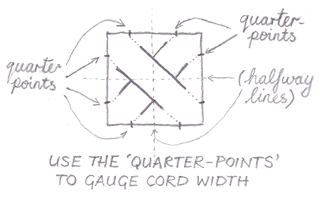 • When you draw the two lines which form each cord, keep them parallel and the same length. So, you’ve got the idea of the crossed cords? It’s the first principle you need to know well: these uniform Xs in boxes are a fundamental building block from which you can create all the knotwork you like. Yes, I know it doesn’t look much like how to draw Celtic knots … yet :) But it will, very soon!